(Energy Analytics Institute, Jared Yamin, 12.Sep.2018) — The decline is consistent and constant as well as consistently and constantly bad, writes Caracas Capital Market in a research note emailed to clients. OPEC released the production counts for its member states today and while overall OPEC production was up 278,000 barrels per day (bpd) during the month, Venezuela’s production continued to collapse. According to OPEC’s August calculations, Venezuela production fell another 36,000 barrels per day (bpd) to 1.235 million bpd. 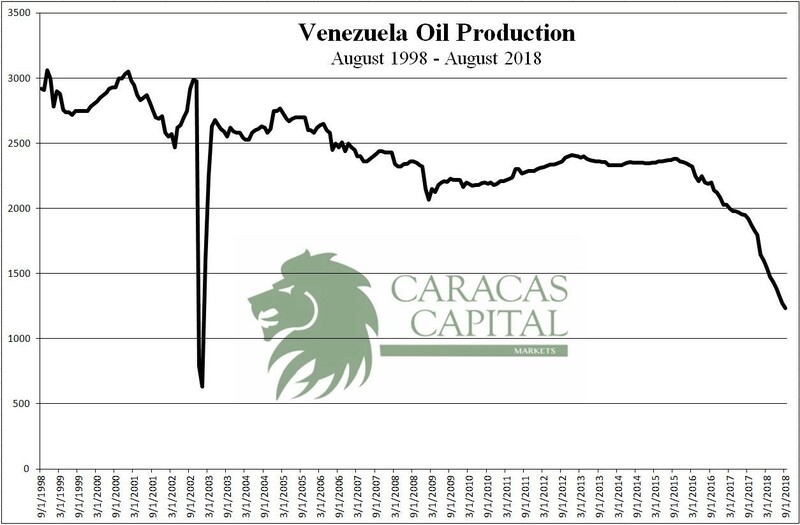 (Venezuela production actually fell 43,000 bpd from the original OPEC July count of 1.278, but OPEC revises their numbers as new data comes in later in the month and moved Venezuela’s July production count down to 1.272 million bpd from the original 1.278 bpd), according to the research note. OPEC calculated that July’s Venezuelan production fall was 42,000 bpd and that June’s fall was 48,000 bpd. In May, Venezuela production fell 43,000; in April, -42,000 bpd; in March, -55,000 bpd; in February -52,000 bpd; in January, -47,000 bpd. Consistently and constantly bad. In the one year period from August 2017 — when PDVSA was producing 1.918 million bpd — Venezuela has lost 683,000 bpd of production. At the current year average price, that is lost income of $47 million a day and $17.5 billion in a year. Making this situation worse is that Venezuela’s current 1.235 million bpd production is just a shade more than a third of what the country was producing 20 years ago before Chavez came to power. Hundreds of billions of dollars lost through communism, corruption and incompetence in a country that can ill afford it. Meanwhile, Venezuela’s drilling rig count dropped by one in August, continues the Caracas Capital Market report. Baker Hughes reports that the number of active drills operating in Venezuela fell to 27 last month, after popping up 2 in July off June’s thirty year low of 26. One of the two drills that was added in July was drilling for gas – the first in over a year. It was still deployed in August. Having failed to capitalize on its natural gas (much less build the Mariscal Sucre LNG plant) for decades, Venezuela signed a deal last week to link into an already existing gas pipeline at a Shell platform in bordering Trinidad waters and through that pipeline pump gas to Trinidad’s Atlantic LNG plant where it will be converted into LNG for export. Long time readers will also recall that Rosneft was given a 30 year totally wide-open lease on a gas field in that area last year. Finally, as we predicted in our “China Promises Venezuela More Money” Report yesterday and correctly forecast in a Report and Wall Street Journal column in July, Venezuela seems to be making headway in getting help from the Chinese, writes Dallen. “No one else seems to have been able to accurately uncover and read these Chinese tea leaves, so I am especially proud of our Caracas Capital team. We continue to knock the ball out of the park for our clients,” writes Dallen. Maduro has just announced that he is going to China to sign some big new deals. Minister of Oil and PDVSA head Manuel Quevedo is also in Beijing meeting with CNPC and is offering to expand natural gas agreements as well. Yesterday, Venezuela’s oil ministry released a statement touting that the Sinovensa joint venture had increased oil production from 70,000 bpd to 110,000 bpd. Aside from oil, gas and drilling, we are anticipating some other upcoming ventures in gold mining, coltan and diamond mining, concludes the Caracas Capital Market note.